Parsha: Hayyei Sarah, "Sh'nei Hayyei"
What is the Meaning of the Word “Navi”? In English, the word “navi” (Nun-Bet-Yod-Aleph) is usually translated as “prophet.” This English word has a connotation of someone who is able to predict the future. But what is the root of the Hebrew word? Is ability to predict the future implied in the Hebrew? I admit I always thought this, because the letters Bet-Aleph (“come”) are part of the word. Rashi (commenting on Exodus 7:1) connects the word with the word “niv” (Nun-Yod-Bet), relying on Isaiah 57:19 (“niv sefatayim”). The word “niv” in this verse in Isaiah means something like the “outgrowth of” or “something that flows from.” Rashbam (commentary to Genesis 20:7) also connects “navi” with “niv.” He adds that a “navi” is someone who is “ragil” with God and speaks God’s words, and that God loves his words and answers his prayers. But Ibn Ezra argues strongly that the root of “navi” is Nun-Bet-Aleph. Despite the eminence of Rashi and Rashbam, it is hard to disagree with Ibn Ezra here. The alephs are always present in the word, so it seems very likely that the aleph is a root letter here. With regard to the meaning of the root Nun-Bet-Aleph, Ibn Ezra tries to infer its meaning from the context at Amos 3:7. There it is stated that God will not do anything unless he is “galah sodo el avadav ha-neviim.” Therefore, Ibn Ezra concludes, a “navi” is fundamentally someone to whom God reveals his secrets. In most instances in Tanakh, a “navi” is someone who was called by God to communicate a Divine message to the people. One verse where this is not the case is Exodus 7:1. Here God tells Moses that “Aaron your brother will be ‘neviekha.’ ” We see from here that not just God can have a “navi.” A human can have one as well. We see from all the above that it is obviously a mistake to rely on English translations. We must ignore the common translation “prophet” and whatever that may imply. We first have to determine the Hebrew root. But sometimes, like here, that is only half the battle. Figuring out what the root means can be another battle. Here Ibn Ezra tried to learn it from a context (Amos 3:7). Rav Hirsch tried to learn it from a different but similar root. Scholars try to learn it from related Semitic languages. One last issue needs to be addressed. The English word “prophet” has the connotation of someone who can predict the future. It is derived from a similar sounding Greek word. Did the Greek word have this connotation as well? Most likely, the Greek word meant merely “one who speaks on behalf of.” See, e.g., Encyclopaedia Judaica (13:1153). Last week, I made an interesting error when I tried to calculate the number of Mishneh Torah sets in Teaneck. I made a calculation based on an assumption of two boys in each family (with each getting three sets of Mishneh Torah as bar-mitzvah presents), plus the sets of Mishneh Torah owned by their fathers. A reader then pointed out to me that his daughters received Mishneh Torah sets for their bat-mitzvah. I also overlooked our new generation of educated adult women, many of whom may own their own Mishneh Torah, separate from the ones owned by their husbands. I apologize for my old-fashioned thinking! I think I will have to have my wife and daughter review my columns each week to correct my old-fashioned thinking and add in the female perspective! Mitchell First is an attorney and Jewish history scholar. He can be reached at MFirstAtty@aol.com. He checks his emails, and has not yet been called upon by God to deliver any lexical discourses. רחם והושע את בניך, הצילם מחרב אויב, פדם ממוות, הגן עליהם מן האימה. שלח נא אורך להאיר את הלב הנשבר של של אבות ואמהות שכולים, של נשים שאיבדו את הקרוב להם. שלח רפואה שלמה לפצועים ולנפגעים, ותן עוז ועוצמה, תקוה ותוחלת לעמך ולארצך. רבון העולמים, תן תבונה לעמים להסיר מלבם איבת שקר מושרשת , שלח אור בינתך בלב המאמינים לדברי שקר , האר את עיני התמימים השומעים לעלילות שוא, שלח רוח צדקך ומשפט בעולמך, סייע לבני האדם לבנות ולנטוע, לעזור לסובלים באמת, לישר דרכי עולם. אב הרחמים הנאמן בבריתו כבר הגיע העת שתשלח לעולמך בשורת ישע וגאולה. לנחם את ילדיך כולם, לתת להם את שלום וברכה, אור ושמחה. Have mercy and save Your children. Save them from the sword of their enemy, safeguard them from death, protect them from danger, and shelter them from fear. Send Your light to mend the broken spirits of bereaved parents, of weeping husbands and wives, of grieving siblings, and of anguished friends who have lost those who are dear to them. Grant complete recovery to the wounded and the stricken and give courage and strength, hope and vision, to Your people and to Your land. Master of the Universe, enable the nations of the world to remove the hardened hatred from their hearts. Shine the light of discernment on those who give credence to lies, and enlighten those who listen to libelous dogmas. Send the spirit of morality and justice into Your world. Help humanity to build and to plant, to support the merciful in righting the ways of the world. Compassionate One, who is true to the Covenant, the time has arrived for You to send a message of salvation and redemption to Your world, to comfort all of Your children, and bestow upon them an era of peace and blessing, light and joy. Parshas Vayeira - The Wickedness of Sodom; Why Should Avraham Avinu Care? The Jewish Values Online website also offers a blog which presents comments on various topics within Judaism and the Jewish world. See http://www.jewishvaluesonline.org/jvoblog/index?aid=0. Rabbi Hecht is also a blogger on this blog. Parsha: Vayeira, "Is Seeing What's Already There a Miracle? Aside from our knowledge of his father Maimon, we know very little about the family of Rambam. For example, we know nothing about his mother. As to his wife, we know that he married in Egypt late in life, in 1171 or a bit later, and his son Abraham was born in 1186. We know the name of his wife’s father, but not the name of his wife. Rambam was born in 1138. Since this marriage was late in his life, while he was in his thirties, biographers often surmise that he must have had a first wife. But there is no evidence for this at present. In one letter Rambam mentions a daughter who died young. But it is unclear if the reference is to his own daughter or a friend’s daughter. He did have three sisters and there is a bit of information about them. But we do know much about Rambam’s younger brother David. The most important thing we know about him is that he died in a shipwreck in the Indian Ocean. A letter from Rambam has survived that describes his reaction to the death of his brother. That is the letter I will focus on in this column. “A few months after we departed from [the land of Israel], my father and master died (may the memory of the righteous be a blessing).Letters of condolences arrived from the furthest west and from the land of Edom…yet you disregarded this. Furthermore, I suffered many well-known calamities in Egypt, including sickness, financial loss and the attempt by informers to have me killed. The worst disaster that struck me of late, worse than anything I had ever experienced from the time I was born until this day was the demise of that upright man (may the memory of the righteous be a blessing), who drowned in the Indian Ocean while in possession of much money belonging to me, to him and to others, leaving a young daughter and his widow in my care. For about a year from the day the evil tidings reached me, I remained prostrate in bed with a severe inflammation, fever and mental confusion, and well nigh perished. 1. From one line in the letter that I omitted, it is evident that the purpose of Yefet’s letter was some financial matter, and not simply to renew his personal connection with Rambam. 2. Rambam’s remark that David had on his possession money belonging to Rambam is of interest. Perhaps it indicates that Rambam was a partner in this business venture of David. See Shailat, p. 229. Very likely, Rambam had been a partner in other business ventures of David as well. Some biographers have written that David’s death caused Rambam to relinquish the life of a scholar and take up medicine as a profession. This is not true. Rambam already attained prominence as a physician in his early days in Egypt. He also seems to have earned money on his own from commerce in precious gems and from teaching sciences (e.g., mathematics, logic and astronomy) to intellectuals. See Kraemer, pp. 161 and 258. Admittedly David’s business trips helped Rambam, as Rambam stated in the letter above: “It was he who did business in the market place, earning a livelihood, while I dwelled in security.” See also the letter from David cited by Kraemer, at p. 251. But it is wrong to read these letters as implying that Rambam was not earning money on his own. 3. A letter was found in documents from the Cairo Genizah from David himself, written while he was in the Sudan, talking about his forthcoming continuation of his journey to India. David wrote that in the locale that he was in the Sudan, no imports had arrived recently, so he decided to continue his journey and go by sea to India. There is no date on this letter, but for reasons explained below, it almost certainly came from either 1169, 1170 or 1171. Kraemer assumes that this letter was referring to David’s imminent journey to India that ended with his passing. In the 1185 letter, Rambam wrote that the evil tidings about David came to him eight years earlier. This would mean that David left for India around 1170 and Rambam did not find out about his passing until 1177. This seems like an inordinate amount of time. Shailat (pp. 72-73 and 198) takes a different approach. He believes that the letter that David wrote in 1169-71 concerned an earlier trip to India, and that in 1176-77 he took another trip to India which resulted in his passing. How were scholars able to estimate the date of David’s letter to 1169, 1170 or 1171? David dated his letter to the 22nd of Iyyar, and mentioned that the Muslim month of Ramadan was forthcoming. As we have all learned, the Muslims have a lunar calendar without an adjustment. Thus, the beginning of Ramadan moves continually. In 1172 and for the three decades after that, Ramadan preceded the Jewish month of Iyyar. See Kraemer, p. 544, notes 36-37. Mitchell First is a personal injury attorney and Jewish history scholar. He can be reached at MFirstAtty@aol.com. He does not have any sea voyages to India planned. Parsha: Lech Lecha, "Leaving Israel"
Parsha: Lech Lecha, Galut Mitzrayim - 400 Years or 210 Years? 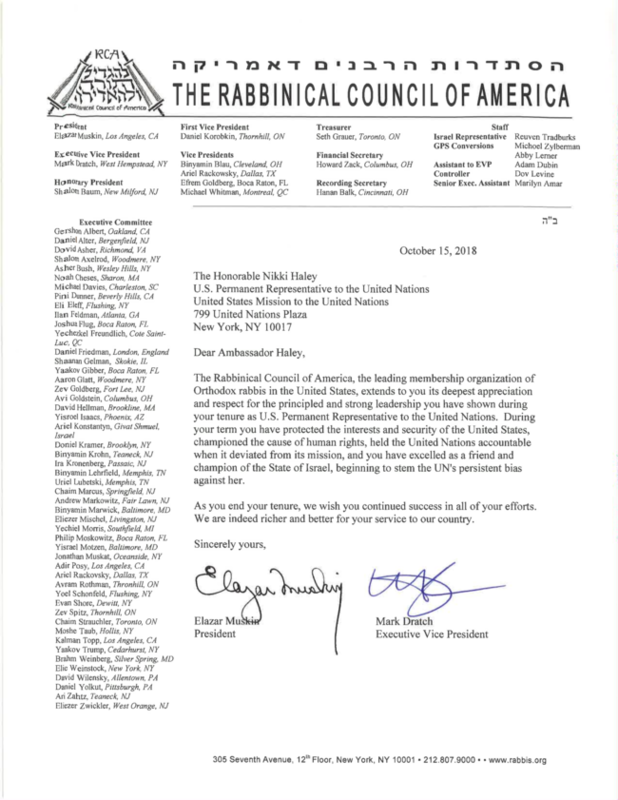 Parsha Lech Lecha - "Pere Adam"
The following letter was sent, from the Rabbinical Council of America (RCA), to Nikki Haley, U.S. Permanent Representative to the United Nations. Click here to open PDF. We are proud to express our deep appreciation and thanks to US Ambassador Nikki Haley for her unwavering support of Israel and the Jewish People and for her courage and strength in confronting anti-Israel hypocrisy at the UN. She stood up for what is right and staunchly defended the State of Israel in the halls of a hostile, biased, anti-Israel United Nations. Ambassador Haley is a true friend of Israel who greatly improved the US-Israel relationship as well as Israel's standing in the eyes of the world. We are sorry that Ambassador Haley is leaving her position but wish her well in all future endeavors. Please join United with Israel and Prime Minister Netanyahu in wishing the best to Nikki Haley and in thanking her for leading "an uncompromising struggle against the hypocrisy of the UN and the truth and justice of our country." We ask that you sign your name and forward this email to everyone you know so that we can present Ambassador Haley with a beautiful thank you letter with hundreds of thousands of signatures. Thank you for participating in this important initiative and for standing united with the People, Country and Land of Israel. PS - Please REMEMBER to forward this email to your family, friends and colleagues. Give them the opportunity to express their thanks too! "These Jews not only adhere to but are often at the forefront of the anti-Trump hysteria. Non-Orthodox Jewish organizational leaders – even traditional Zionists – remain silent or cozy up to their liberal constituencies even as DonaldTrump treats Israel better than any previous American president and, for the first time, is publicly exposing Palestinian intransigency, promotion of terror and the millions of dollars awarded to killers and their families. These same Jews never raised an eyebrow when President Barack Obama was uttering his outrageous statements morally equating Palestinian terrorists with Israeli defenders." "When you are offended at any man's fault, turn to yourself and study your own failings. Then you will forget your anger." Dr. Moshe Sokolow, a professor of Bible at Yeshiva University for many years, and Associate Dean of Azrieli, came out with this book in 2015. I love the title! The book covers the following subjects: Authorship and Editing, Canonization, Masoretic Text, Parshanut, Translations (e.g., Targumim and Septuagint), Tanakh and Modern Scholarship, and Pedagogy. I would now like to digress a bit and point out the evolution in my own understanding of Rashi. In my elementary school in the 1960’s, we used those blue linear Rashi’s with English translation. We saw that Rashi was continually providing us with comments, but we had no idea that he was providing these comments to answer a question! In fact I do not recall ever seeing an editorial comment in these five volumes that pointed out that Rashi was here writing to answer a question! Only in high school was I finally told that Rashi was writing because there was a question in the text that was bothering him. Regarding Ramban, Dr. Sokolow quotes an interesting passage from Ramban’s introduction regarding Ibn Ezra: “We shall conduct an open rebuke and a secreted love.” Who knew that Ramban had a secret love for Ibn Ezra’s commentary! Now it is time to discuss the weakness of Dr. Sokolow’s book. My 2016 Honda Odyssey manual is 561 pages. This book is only 219 pages. Given all the topics it was meant to address, this book needs to be something like that length as well! For example, his discussions of the authorship of each book and of the canonization process are way too brief. I am not interested in who invented each part of my Honda Odyssey, or how the Honda Odyssey evolved over the decades. But in the case of Tanakh, I am interested in authorship and evolution/canonization. These sections of the “manual” should have been longer! Another example of his being too brief is his discussion of canonization. He cites Dr. Sid (Shnayer) Leiman’s important book: The Canonization of the Hebrew Scriptures: The Talmudic and Midrashic Evidence (2nd edition, 1991). But he does not mention Dr. Leiman’s conclusion that the Tanakh was closed around 164 B.C.E. and that a passage at II Maccabees 2:14:15 may allude to the closing of the Tanakh by Judah Maccabee. He also does not mention Dr. Leiman’s important distinction between inspiration and canon. Dr. Leiman writes that a book can be in the canon, but that does not necessarily mean that it was viewed as being composed with “ruach ha-kodesh.” Whether Shir Ha-Shirim and Kohelet were composed with “ruach ha-kodesh” is what is being debated by the 2nd century C.E. Sages in Mishnah Yadayim 3:5. But all agreed that they were already in the canon. Even if Dr. Sokolow disagreed with Dr. Leiman’s points, they deserved to be mentioned. Of course, had Dr. Sokolow attempted to be more comprehensive in each chapter and set out to produce a 500 page manual, he likely would never have finished. So I sympathize. Finally, I would like to point out one interesting suggestion that he makes (at p. 61) that I am still trying to digest. He says that the Hebrew phrase “leshon ha-kodesh” does not mean the “holy language.” That would be “ha-lashon ha-kedoshah.” “Leshon ha-kodesh,” he suggests, means “the language of the sacred one,” i.e., God. Similarly he suggests that “leshon ha-ra” means the language of the Satan. I am not yet convinced that either of these interpretations is correct. I would be interested in hearing from any of you with your thoughts on this matter. I find that “ha” in “leshon ha-ra” especially troublesome! Mitchell First is a personal injury attorney and Jewish history scholar. When not contemplating the meaning of the term “leshon ha-ra,” he can be reached at MFirstAtty@aol.com. "The Hope: Churchill & the Jews"
Origin of the words "Erev" and "Boker"